Describe your universe. Choose any combination: magic, horror, technology, cyberpunk, dystopian, space, post-apocalyptic or fantasy. Name two good things and two bad things in this universe. Players, tell us who you are. These might describe you: humanoid, android, fantastic or animal. You'll assign three bonus points (+1) and two penalty points (-1) to any of these Abilities: Strength, Dexterity, Wisdom, Intelligence or Social. You start with 0 Damage Points. DP > 3 will kill you. Sleep will heal 1 DP. The Game Master will describe the universe and present Obstacles (encounters, hardships, �) in the most colorful way. Each Obstacle will have a Difficulty: easy: 1, difficult: -1, very hard: -3. Obstacles can suffer 0�7 DP before destruction. Additional rules will self-create during the game. Your goal: create stories; discover treasures, secrets; liberate people; be heroes; bend the rules. I like dice. I like UTF. I like UTF dice symbols. There is this saying, agreed upon by many, that you learn from your mistakes. I always interpreted this as saying: by making a mistake, you know in the future how not to make the same mistake again, thereby enhancing your knowledge of the subject. But I believe there is a more profound way of learning from mistakes: mistakes allow you to tread a path, previously unexplored. Many times this path is worse than the original path, but sometimes the path provides a (better) alternative than the original. This can clearly be seen in evolution. There are many mistakes during evolution, and they die off right aways. But sometimes the mistakes actually enhances the survival � or ability to procreate � of the individual. Let's say your system has got 6 stats: STR, WIS, CHAR, INT, ARC(ane), DEX. During a game the PC will encounter problems: fights, magic-use, thiefing, etc. Each problem will have a skill and difficulty attached. cross broken bridge : 10DEX. To determine if a player can solve a problem a 1d20 is rolled. If the outcome is less than the difficulty that the player fails. To cross the bridge Sardon the Dwarf rolls a 1d20 -> 8. That's fail because it is less than the difficulty of the problem. To get a better result Sardon can take his DEX points and subtract these from the difficulty. Sardon decides to spend 5 DEX points. The difficulty is now reduced from 10 to 5. Sardon only has to roll 5 or higher. Sardon could have spend 10 DEX points to get a 100% success roll. If a player rolls higher than the minimum required difficulty the surplus points can be used to enhance the effect of the roll: maybe speed, damage or quietness can be "bought" using the surplus points. 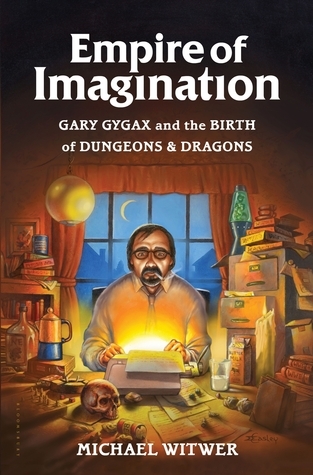 Half of it is about Gary Gygax's re-imagined life by lack of actual data. Those parts of the book that actual mention facts are far more interesting than the stories writer Michael Witwer made up to fill the pages. The obituary on the wired website gives a better and factual insight into the live of the grandfather of Fantasy Role Playing Games. Have a look at the stories of Tim Kask on Youtube, made by the Dorks of Yore to have more insight in the early days of TSR. Based on the letter-pair frequency of Jack Vance's Cugel The Clever I created this blob of letters. Each subsequent letter was randomly picked from a weighted matrix. A great source for finding new words or names. Working on my krita skills lately. I colored this map I designed in Inkscape. 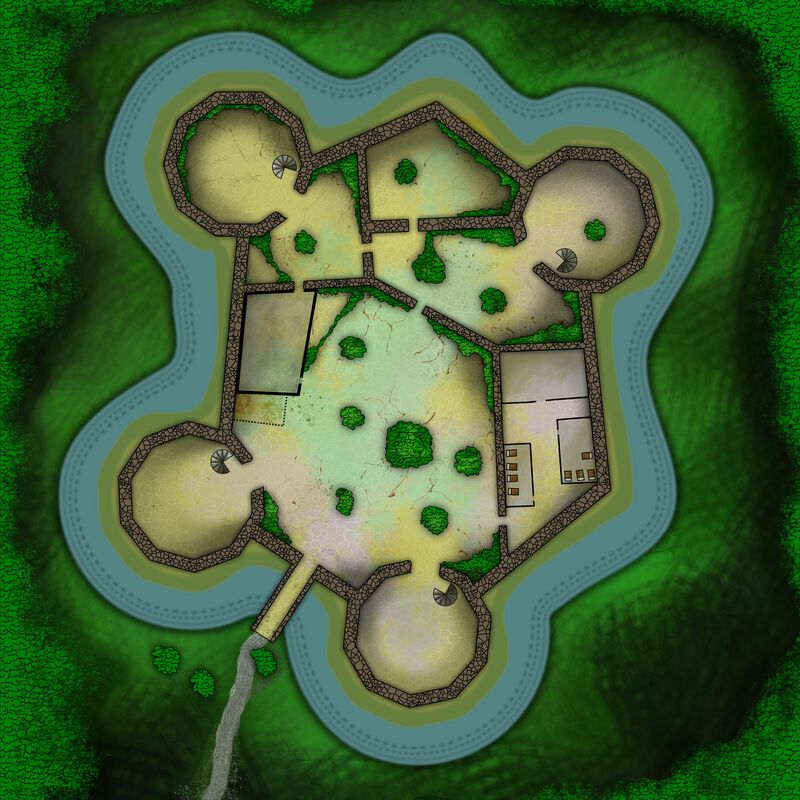 It's a castle that's been overtaken by an evil wood elf called Rath. The castle once belonged to Kasani, the Lord of Thurich, now part of the large tree in the courtyard. Magic items are a very powerful and fun part of many RPG's. Why? Because they open up narrative branches to your game in unusual ways. Another aspect of magic items is that they are single objects. That means they can be transferred to different players. This in contrary to spells. These are usually restricted to certain classes and aren't unique (any druid can have druidic spells). Magic items can do anything to your narrative. Magic items can take all kind of forms, both in appearance and mechanics. They can be restricted to be used one time only, like a potion that needs to be swallowed or a powder that needs to be burned. Others are more permanent like wearables, jewelery, clothings and such. More interesting are magic items that have drawbacks: you gain some extra power at the cost of something else. Whether it is worth is using them depends on the situation and on the risk the player is willing to take. It's a ring. That means it can be worn by anyone. Anyone with the right size of fingers that is. The one ring in The Lord Of The Rings had this magic ability to grow and shrink. I assume this was done on purpose by Tolkien to account for the fact that it could be worn by Frodo, Sauron and Isildur. What I find so great about this little fix to maintain consistency is that it opens up a new property of the item and can create new narrative behavior: growing the ring makes Frodo almost loose the ring. Likewise shrinking the ring can prevent the bearer, or anyone else, to take it of. Taking this to extremes we could see how a shrinking ring can cut of someone's finger (this makes me think about a spell that can shrink stuff, used in this way could be very powerful). Does a ring have to be worn to use it? I tend to believe it must. Otherwise it could be any kind of object: the ring part adds something to the narrative if, in fact, it is used as a ring. 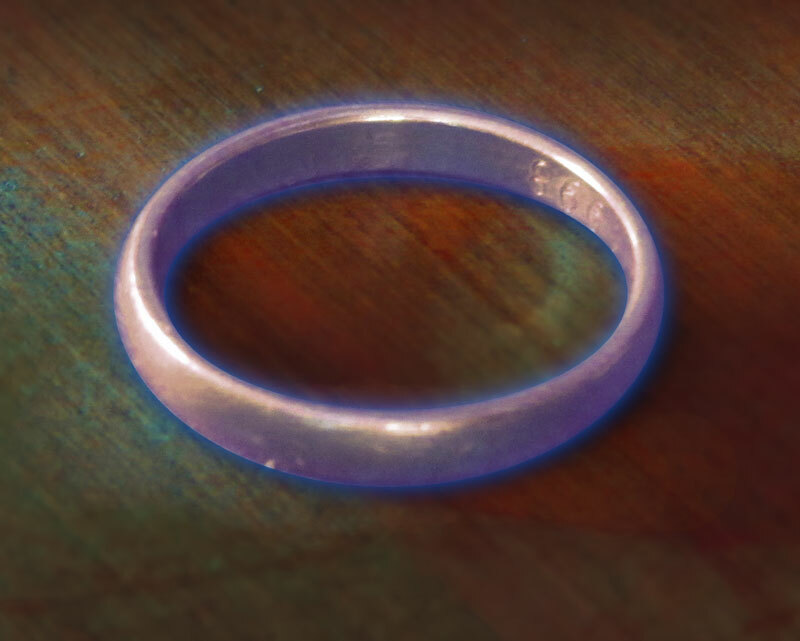 Rings have a certain durability associated with them. Rings have a permanent ring (pun intended) to it. Rings are often valuable items made of precious metal, decorated with precious gems. So by itself it already could be an expensive item to own. Being a precious item make is vulnerable for theft. Even if the magical properties aren't obvious it is still something people will want. If you make the ring out of less expensive material like bone, wood or rock it will affect the durability of the item. Wood can burn, rock can break, bone is susceptible to acids. So here you have your mechanics to make the item less permanent in case it turns out to be too powerful. So, the ring of reverse levitation. It does levitate stuff ... people .. the bearer. Only, it does not levitate. It does the reverse. What is exactly reversed? The levitating (rise into the air)? Or the direction of the levitating. The antonym of to levitate is to land. Now that could be useful. Certainly for the players of the falling kind. They might benefit from landing. A ring of landing could be quite useful in mountainous areas or in sky-cities. If on the other hand we opt for the reversal of the direction (into the air) we get something like sink into the ground. This is potentially very harmful for any subject of the effect of the ring. Unless a save way to do so is included with the magic. The ring can be very handy for exploring underground dwellings or multi-level mines. If you reverse the lifting part, you can end up with a ring that takes things out of the air. Birds, dragons or flying wizards. The description doesn't make it clear what exactly is levitated. Is it the bearer, or some other people and stuff? To answer this we can look at the functioning. Obviously if the ring's powers is harmful it like won't have the bearer as subject. You'd never wear a ring the potentially can kill you. If the power is beneficial it could be both for the bearer or someone else. If left undefined the ring could be used to reverse levitate cities, countries, mountains. You could sent a castle to the other side of your planet. This makes the ring far to powerful. You don't even have to be there to make it happen. You only have to wear it. To limit the area to which the ring has effect you can say it needs to touch the subject, or the bearer needs to see the subject. That doesn't solve all. If the bearer touches a city, will that count too? You can see all three moons hanging in the sky for that matter. There need to be more limitation. Something like weight might do it. One can reverse levitate a subject equal of less the weight of the bearer. How far can the subject be reverse levitated? Again this is not solved by using touch or sight. Though the touch component can make for nice narrative shifts, like: what if you let a wooden board sink into the earth while standing on it. You'd be using it as some subterranean elevator. Just release the board to get off. The powers can be limited in time. Maybe it drains the bearer or comes with a cost. This a nice mechanism the forces the player to balance the benefits of the action against the harm it will bring. This trade-off can directly interact with the game mechanics. Does using it spend resources (hit points, mana, XP?) or does it influence the roll of the dice? Maybe by using it you get a penalty on subsequent throws. What game mechanics will be affected is of course largely dependent on the game system you use. I believe a ring of reverse levitation can be a powerful item and should have some sort of trade-off. This inconspicuous ring made of the metallic wing bones of the long extinct mud-swimmer Droth is thought to be the final work of Ezrak. Due to an mispronunciation of the word Upllewh during the invocation to fixate the final spell hook to the ring the item ended up to have some erroneous behaviour, the most notable quirck being the direction of the levitation, hence the name. Ezrak ended up 10 meter below the ground, crushed by 25,000 kilograms of solid rock. Anything the bearer of the ring touches while uttering the magic word will gently sink down, passing through most materials without resistance leaving an empty space lasting while the object is being touched by the bearer. Ironically the magic word is "Upllewh." It took seven assistent thaumaturgist three weeks to find the correct pronunciation. The mass that can be moved using the ring roughly equals the mass of the bearer. I like my dice pre-rolled! Todays pre-rolled die is the plain old 1D6. Any of the numbers has a 16.67% change to be rolled, says AnyDice.